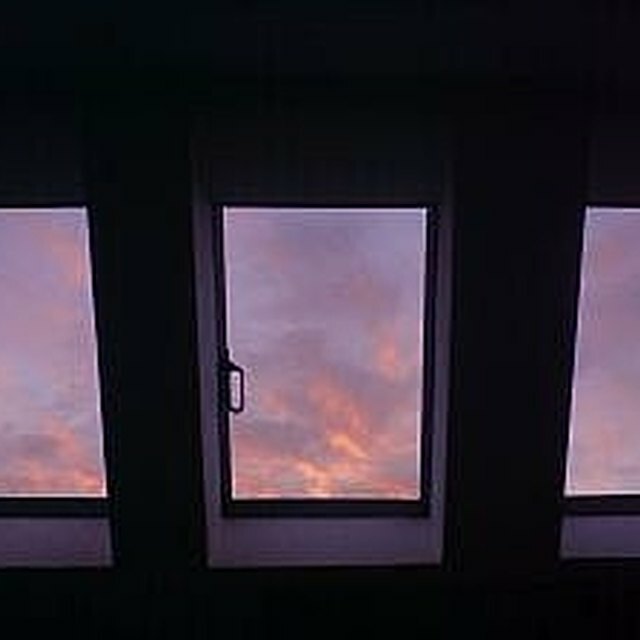 Door windows, also called door lights, add interest to a door and let light pass through their part of the door. Unfortunately, door lights of any shape also compromise a home's privacy and security. Several options exist for enhancing that privacy for a front door with an oval window. Hanging curtains on the door is one option, but it may damage the door's finish. Glass etching is also effective, but it is permanent. Stick-on, static-cling window film creates an attractive light-diffusing privacy screen, and installing the film is a simple project that takes only minutes. If you wish to change the film, its removal takes only seconds. Window film is often used to increase privacy in bedrooms and baths. Clean the oval window thoroughly with spray window cleaner and a cloth. Rinse and dry the window. Cut eight pieces of 4-inch long cellophane tape. Roll each piece of tape to make four loops about 1 1/2 inches wide with the adhesive on the outside of each loop. Stick the tape loops on the oval window, spacing them evenly about 1 inch from the window's edge. Position stick-on, static-cling window film on the window. Do not remove the film's paper backing. Press the film against the window, starting in the window's center and rubbing toward the outer edges. Reposition the film if necessary to ensure it is flat and smooth. Use a dull butter knife to crease the film where it meets the oval window frame all the way around the window. Remove the film and cellophane tape from the window. Trace a pencil line around the oval crease you made on the window film. Cut along the crease with scissors to trim the film to the window's shape and size. Spray the window liberally with the spray window cleaner. Peel the paper backing from the window film. If the window film is textured on one side, position its smooth side against the window, aligning the film's edges with the window glass' edges. If the film isn't textured on one size, just use the same technique to align the film's edges with the window's edge. When the film is in its proper position, peel down the top half of the film. Apply a little more spray window cleaner to the window. Beginning at the center of the film, smooth it against the window with your fingers, and move your fingers toward the top and sides of the window to smooth the remaining top half of the film. Repeat the procedure to smooth the bottom half of the window film against the film. Spray the installed window film with the window cleaner. Working from the center of the film toward the outer edges, press and slide a squeegee to remove air bubbles trapped between the window and the film.